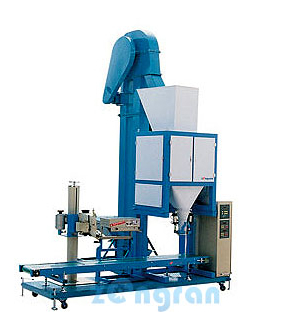 This machine is designed for ultrafine powdery products and high accuracy packaging requirements. The weight sensor installed in the container completes the two-speed filling, metering and lifting work. It’s suitable for a wide number of applications including food additives, toner, fire extinguisher dry powder and other ultrafine powdery products. 1. The container tray below equipped with weight sensor, it has fast and slow filling system to ensure the high accuracy. 2. Servo motor drives the tray movements, lifting speed can be arbitrary set. During filling process, basically there is no dust pollution to the environments. 3. Servo motor and servo drive control the auger to ensure the stable performance and high accuracy. 4.PL controller, friendly touch screen，easy to operate. 5. Stainless steel structure, modular container, easy to cleaning. 6. Filling head with a hand wheel to adjust the height according to different size of bags. 7. Fix auger mounting structure ensures that material won’t be affected. 9. Pneumatic bag-clamping device or supporting device is optional according to different requirements. Application︰ This machine is designed for ultrafine powdery products and high accuracy packaging requirements. The weight sensor installed in the container completes the two-speed filling, metering and lifting work. It’s suitable for a wide number of applications including food additives, toner, fire extinguisher dry powder and other ultrafine powdery products.